In order to improve the iPhone user experience for users with blindness or low vision, Apple developed VoiceOver - a gesture-based screen reader that enhances on-screen interactions through the use of narration. Even when you take applications out of the equation, VoiceOver can be rather difficult to grasp and understand its assistive-like nature. At times, it may also leave you feeling confused as to what exactly is happening, why it’s happening, and how it’s happening. The below guide is intended to give you an overview of using VoiceOver on your iPhone (iOS being the operating system), so you can start exploring how a user can better interact and engage with your application. And just in case you’re looking at the tablet version of your app, VoiceOver on iPad is pretty much the same, but some gestures and multi-taps have different results. We’ll go through the steps of enabling VoiceOver, getting familiar with its gestures, and even simulating on your device a 'screen off' mode, which should help you understand how users with blindness or low vision may experience your application. On your iOS device, navigate to Settings > General > Accessibility. You'll see the 'VoiceOver' option at the top of your list. However, it's best NOT to enable VoiceOver from here just yet (as disabling VoiceOver can be rather tricky to start with). Scroll down the list until you see 'Accessibility Shortcut' and press it. You can now enable VoiceOver by triple pressing the home button or side button if you have a new Apple device. VoiceOver can also be disabled by triple pressing the same button. There are two main methods of navigating with VoiceOver enabled: touch navigation and flick or swipe navigation. These two techniques are slightly different from one another so let's explore them in a little more detail. Each of the gestures below (and Screen Curtain - a feature that allows you to turn off the display) will only work when VoiceOver is enabled. Touch navigation - Simply touching anywhere on any object on your screen (such as an app icon or a button in an application). Swipe or flick navigation - Involves swiping in a left, right, up, or down gesture (such as swiping through app icons on your home screen) to navigate through content on your screen. You'll notice that by default this functions in a left to right and top to bottom order (for instance, as you swipe through the app icons on your home screen, once you reach the end of the row you'll automatically end up on the next row below your current selection). Image of two iPhones. First iPhone has zig-zag finger gesture going down and across middle of screen. Second iPhone has finger gesture going from left to right across middle of screen (images courtesy of Apple). Want everything read out loud? If you struggle to read the text on your iPhone, or don't want to use as many touch gestures when navigating, consider utilising the Speak Screen function. Simply swipe down with two fingers to read the page from the selected item, or swipe up with two fingers to start at the top of the page, and VoiceOver will read the content out for you. Another way of activating this feature is telling Siri to 'Speak Screen'. You've also got the option to adjust the voice's dialect and speaking rate, and have words, sentences, or words within sentences highlighted as they’re being read. By now, you're probably thinking that's a lot of voice feedback. So, how do you pause it? You can pause and resume VoiceOver feedback by tapping 2 fingers on the screen at once. Getting to the Home screen? On devices with a home button, you can simply press the home button to go home. But if you have a newer device without a home button, you can swipe up from the app switch (the horizontal line at the bottom of your phone’s display) and release once you feel the first vibration. Image of iPhone with gesture of finger swiping up from the bottom of the screen (image courtesy of Apple). Similar to flick navigation above, if you touch and move 3 fingers on the screen, you'll be able to navigate between pages and content. For example on the home screen, if you press 3 fingers on the screen and swipe them from right to left, you'll be able to navigate between the different pages of icons. Image of four iPhones. First iPhone has three finger gesture going in straight line from left to right across middle of screen. Second iPhone has three finger gesture going in straight line from top to bottom across middle of screen. Third iPhone has three finger gesture going in straight line from right to left across middle of screen. Fourth iPhone has three finger gesture going in straight line from bottom to top across middle of screen (images courtesy of Apple). If you find yourself in a detail view (for instance, you were in your mail list and you're now reading an email) or are simply in a view you don't know how to get back from (such as viewing a folder of icons), you can place 2 fingers and squiggle a 'z' shape and continuously keep doing this until you navigate back. This is known as the two finger scrub. Image of iPhone has gesture of z-shape performed with two fingers in middle of screen (image courtesy of Apple). Too much content? Learn the Rotor. This gesture is one of the more challenging to learn, but once mastered you'll be able to fly through all of the content with ease. The rotor allows you to select how you would like to navigate through the content (if supported by the application). For instance, you can choose to only listen to headings so that as you swipe, you'll just be swiping from one heading to another instead of through every single object. To perform the rotor gesture, place one finger on the screen and then add another finger to the screen. With the second finger start moving it in a clockwise or anticlockwise circle (the whole gesture should look like you are using a protractor). 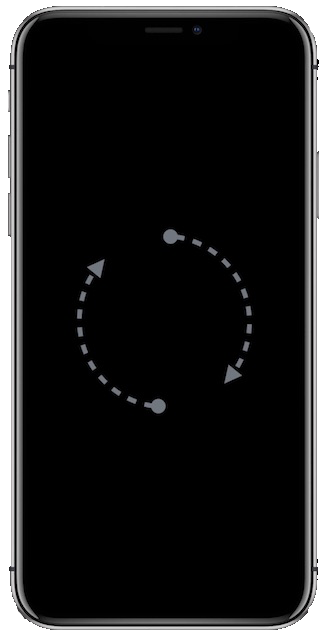 Image of iPhone with gesture of one finger going in clockwise semicircle on right side of screen and second finger going in clockwise semicircle on left of screen (image courtesy of Apple). To assess just how well your application supports VoiceOver, you can enable a feature called 'Screen Curtain'. Screen Curtain will turn off the screen for the application you are in but still enable you to navigate through the content using VoiceOver. Basically, you won't be able to see anything at all, but you should still be able to fully use your application. This is a great tool that really helps put you in the shoes of a user who may have a vision impairment and to help you understand how others may interact with your application. To enable or disable Screen Curtain, triple tap 3 fingers on the screen at the same time. There are two methods of navigating with VoiceOver enabled: touch navigation and flick or swipe navigation. You can pause and resume VoiceOver by tapping two fingers on the screen at once. Learning the Rotor gesture is tricky, but will help you navigate through content with ease. Don’t forget, some users will fine tune their customisations for more efficient typing, voice, speed, and navigation. Therefore, it is highly recommended to tick off as many of these accessibility options as possible to ensure everybody’s preferences are met. Now you know the different ways in which your app can be used and interacted with, consider working alongside your product or development teams to take things a step further. What accessibility issues need improving upon? And how can your app be made more inclusive?